It's my privilege to love you. His lips were soft, warm and felt overwhelmingly right against mine. I fell into it, oblivious to anything other than the safety in his touch. One by one, the senses flowed from me as he pulled them away and set them free. It must have hurt him. The senses hurt the hell out of me.. He was my partner, my soulmate. As my body started to weaken, he wrapped his arms around me, supporting me. He kept his focus until the last of the senses had floated from me to him and then, when it was just us, the kiss lingered as we stole a few extra seconds. We both knew it was wrong – but letting go seemed impossible. Even the greatest bringers of justice will only find salvation in surrender. Gosh, this series keeps on getting better! 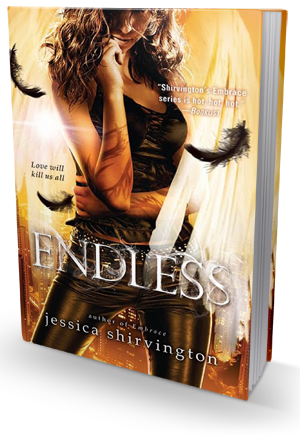 Jessica Shirvington delivers yet another fantastic instalment in the Embrace series, a great YA paranormal fantasy series featuring angels like you've never seen them before. In Endless, things get even more intense, more entertaining and - most of all - more devastatingly heartbreaking. It's a wild ride of violence, intrigue and love. Hands down my favorite book in the series thus far. And let me tell you one thing, if you haven't yet read any of the books in the Embrace series, you are seriously missing out. One of the things I love the most about this series is its awesome readability. I sit down with one of the books and the time stops. I always find myself completely immersed in the story, inhaling every word, and when I arrive at the end of each volume I feel sad and angry at the entire world for making me wait to find out what happens next. And trust me, it's not easy to be patient when faced with Jessica Shirvington's unmatched cliffhanger endings! The suspense is enough to give you a cardiac arrest! Endless, while still filled with brutal confrontations, breathtaking action and love dilemmas (just like all the previous books), explores Violet's family life more in depth. And it's not a happy or pleasant thing for Violet at all. She's struggling to understand things and feels like she's losing control over her own life. Self-doubt, confusion, heartbreak caused by her complicated relationship with her soulmate-partner Linc and her even more complicated feelings for Lilith's son, Phoenix - it all comes crashing down on her and she's about to break down. With Lilith now unleashed and kidnapping the Grigori children, and Violet's mother back from the dead, Violet's world and psyche threatens to crumble down. Will she be able to protect all the people she cares about? Complex, charismatic and relatable characters (including the strong supporting cast!). Solid and well-thought plot line that gets thicker and better with every bite, um, page turned. Moments of overwhelming passion, lust and forbidden love that are oh-so-hawt! Emotionally engaging, heart-wrenching developments. The Embrace series has it all and more. To me, it's the absolute best angel series out there. Shirvington's world and character building skills are superb. The intricate mythology she created - completely mesmerizing and fascinating. I have not a single complaint about this book. Maybe except for: "why do you make me wait so long to find out what happens next?!" I seriously can't wait for the next book to be released!